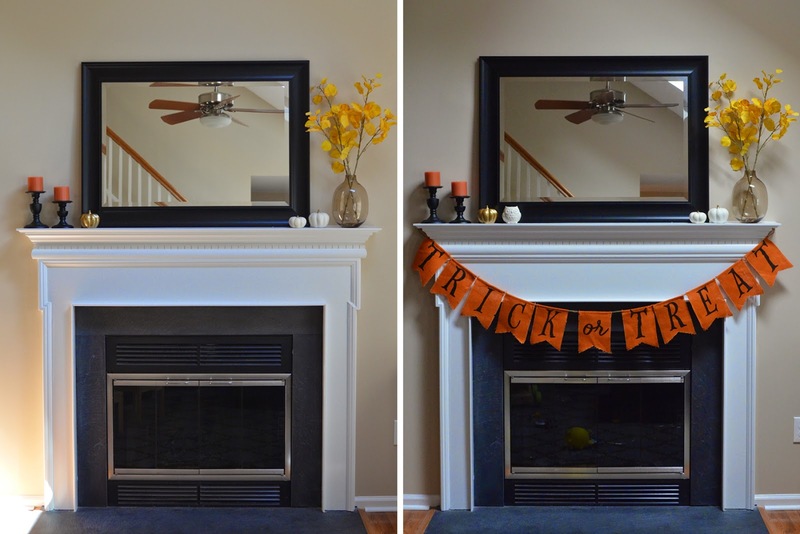 I decorated the mantel for Fall back in September. Now that October is here and Halloween is on it's way, I added some extra decorations to make our house a little more festive. When you enter our house, you see our Welcome Sign. Our bathroom is off the foyer, so I hung this Halloween sign on it's door. Inside, I put our personalized pumpkin as well as a pumpkin candle. In our dining room, I added a bunch of pumpkins and gourds. I mixed some ceramic and candle pumpkins in with the real variety. I also added some "Halloween filler" to the centerpiece bowl on our dining table. Finally, in our living room, I updated our mantel. While I only added the Trick or Treat Banner and the little owl candle holder, it makes a huge difference when you walk in the room. I did all this decorating while Noah napped, and he was pointing and gasping at all the new stuff when he woke up! 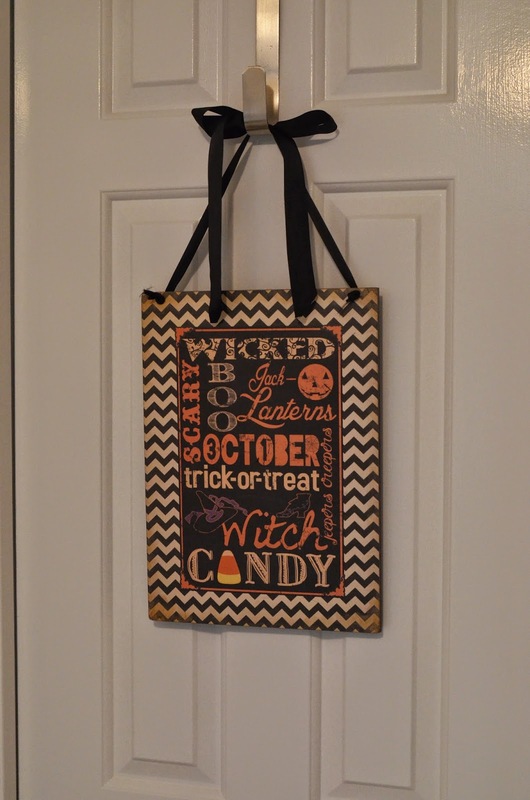 Do you decorate for Halloween or just stick to fall decor? How sweet that Noah recognized all your decorating efforts! Looks great! I love your decorations!!! 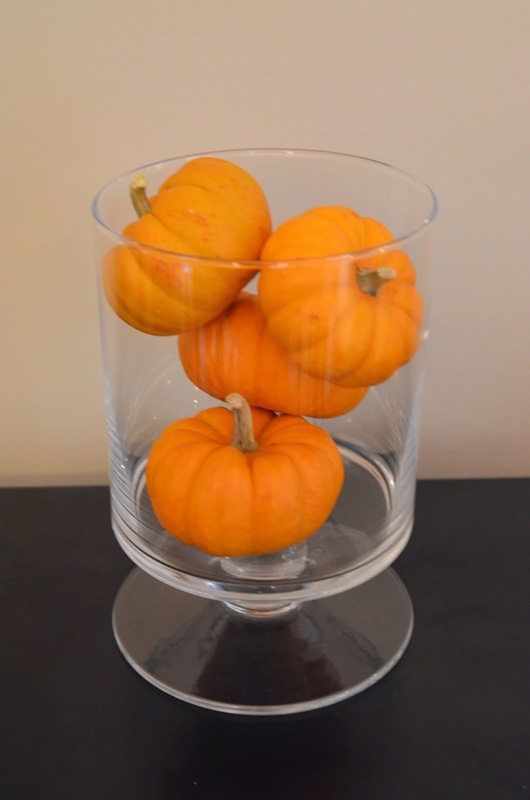 I totally bought some of those little pumpkins this weekend to decorate with. Seth thought I was crazy and I was "wasting money" but I quickly told him that if we don't carve them, then they will last through Thanksgiving and be decoration then too. More bang for your buck (and then he was totally ok with it!). All the decor looks great! I definitely do a combo. Halloween and fall just fall into the same category in my book. I do usually take the more halloween-y things down for Thanksgiving! 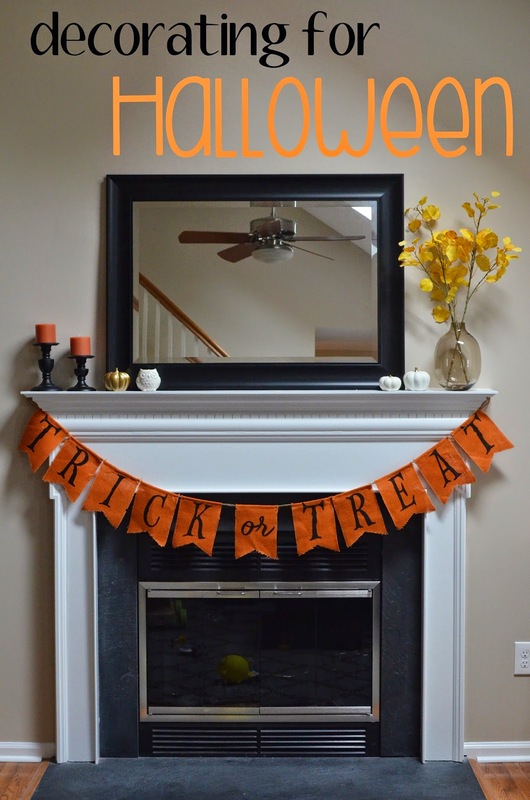 I love the banner on the mantel! And, how awesome that Noah noticed the new things you put up. That was my fave part this year, that Aria actually noticed that there were new things up and decorated. Love all of the decorations! That banner is super cute! I love your decorations. And that they are fall and Halloween - I do a little of both. More fall this year than Halloween but a decent mix. I love that you also decorated your bathroom too. I always try to put something festive in our main bathroom. :) Thanks for linking up with us! Your house looks so adorable! Love the pumpkins everywhere! We do a bit of a combo though I didn't decorate until Halloween so most of ours right now is more Halloween & I'll shift it to just fall in November!